Growing up I'd definitely stay that I was more of a sweet tooth person. Recently my tastes buds have been shifting more towards the salt spectrum - pickles, cheese, anything spicy, to name a few. But towards the end of last year I purchased a candy thermometer and it totally changed my life. I remember the first time I watched the movie Chocolat and I was entranced by the scenes in the chocolate shop where she made the chocolate. I loved watching her spread it out and turn it into shiny delicacies. Making candy myself was something that never occurred to me as possible (although I think I made my fair share of molded chocolate lollipops as a child), until recently. The candy thermometer changed all that and I immediately set off to make the Bourbon Sea-Salted Caramels from Bon Appetit that I've been drooling over for the past couple of years. They were surprisingly easy, just requiring precise attention, and packed with flavor - perfectly satisfying with a nice kick from the bourbon. My next goal is to do something with chocolate, and then to perfect an array of caramel sauces. Have you made anything with a candy thermometer before? I'd love any recipe recommendations! Lightly coat an 8x8” baking pan with nonstick spray and line with parchment paper, leaving a 2” overhang on 2 sides; spray parchment. Bring sugar, corn syrup, and ¼ cup water to a boil in a medium saucepan over medium-high heat, stirring to dissolve sugar. Cook, swirling pan occasionally, until mixture turns a deep amber color, 8–10 minutes. Remove pan from heat and whisk in sweetened condensed milk and butter (mixture will bubble vigorously) until smooth. Stir in vanilla extract and cinnamon. Fit the pot with thermometer and return to medium-low heat. Cook, whisking constantly, until thermometer registers 240°. Remove mixture from heat and whisk in bourbon and salt. Pour into prepared pan; let cool. 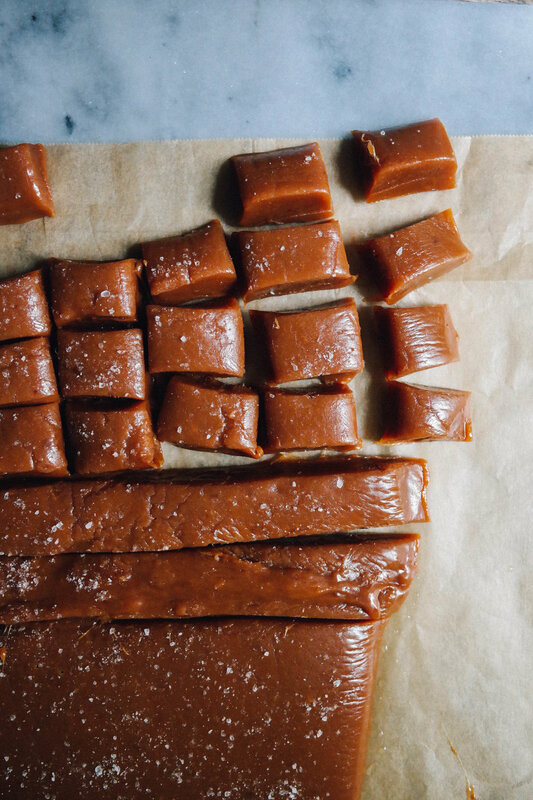 Sprinkle caramel with sea salt, cut into ¾” pieces, and wrap individually in parchment paper.